Anon. sale, Sotheby's, New York, 16 February 1989, lot 444. Sotheby's, New York; sale, Sotheby's, New York, 14 November 1990, lot 424. New York, Hammer Galleries, Modern Masters, May-July 2011, p. 16 (illustrated in color, p. 17). Les amoureux au visage vert combines many of Chagall's favorite motifs, its nocturnal vision filled with magic and poetry. A violinist, lovers, animals and flowers are all shown against an interior/exterior backdrop with elements that recall Vitebsk, the home of Chagall's youth. This is an image of the night, suffused with whimsy and romance. 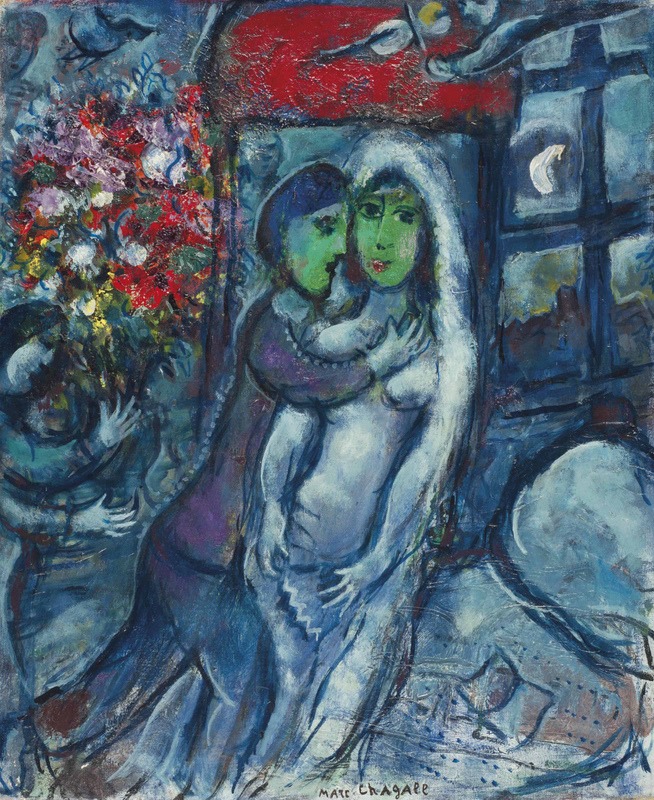 At the same time, Les amoureux au visage vert displays Chagall's virtuosity in the realm of color: while the canvas is dominated by the dark blues of the night scene, interspersed are bold flashes, of red, green and the searing white of the crescent moon. In his pictures, Chagall often superimposed his nostalgia for the lost Vitebsk of his youth upon the world he now inhabited. By 1964, he was an internationally acclaimed artist, creating murals and stained glass compositions for the Opéra, the United Nations and the Hadassah hospital. At the same time, his iconography remained firmly rooted in his memories of his youth in Vitebsk, in present-day Belarus. The animals, the characters and indeed the fabric of the town would haunt him throughout his life, providing lyrical solace, the vanished world staying alive through his pictures. Describing one of the rooms he had in Vitebsk, when already an art student, he would write, in terms that recall Les amoureux au visage vert: "My room was lit by the deep blue that fell through the only window. The light came from a distance: from the hill, where the church stood. I always enjoy painting that church and that little hill again in my pictures" (My Life, London, 1965, p. 79). Here, that town appears through the window at right. By the time Les amoureux au visage vert was painted, Chagall had been away from the Vitebsk of his youth for decades. Chagall's home in Vence was filled with his own early works, themselves often representing fresher memories of his then-recent past in Vitebsk; these served as constant refreshers and reminders for the artist during the post-war period, allowing him to plunge once more into that lost universe. One of the near-constant themes, one that added another layer of reality for the artist, was the presence of music, here embodied in the form of the violinist shown at upper right. Just as Fiddler on the Roof was itself derived from tales of life in Hasidic communities, so too Chagall revived that constant presence of the violin in town life. (fig. 1) Marc Chagall, L'Hiver, circa 1966. Sold, Christie's, London, 18 June 2007, lot 65.